New website and our busiest 12 months ever! No sooner had we completed a huge spectacular event at the Brighton Corn Exchange with nearly 500 guests for the Institute of Chartered Accountants complete with VIP guest speaker William Hague MP. Nikki was asked to design the flowers for the opening of the Chinese Whispers: Chinoiserie in Britain 1650 -1930 exhibition at the Brighton Museum & Art Gallery. She chose blood red roses with gold bamboo in black lacquered containers to replicate the glamour of this period. (This exhibition continues until the 2nd Nov 08). Our next large event was at the Royal Pavilion for the UBS investment bank. They held a VIP dinner in the magnificent Banqueting Hall, with a drinks reception in the great Kitchen. We used our 3ft tall table candelabras for the dinner decked with roses, glossy green foliage, trailing green amaranthus and ivy. For the entrance a large classical urn of green hydrangea, deep pink ‘Milano’ and ‘Grand Prix’ roses with metre tall green gladioli was chosen. The look was opulent and sophisticated, the flowers looked stunning. We have also just taken on the contract to supply the flowers for the new boutique hotel in the North Laines,’ My Hotel’ – They have just had their grand opening party, (with a difference!) they staged an ‘American Beauty’ style themed evening (we used over 400 red roses for petals) as well as filling the restaurant, bars, Carousel suite and function rooms with arrangements which added the perfect finishing touch. 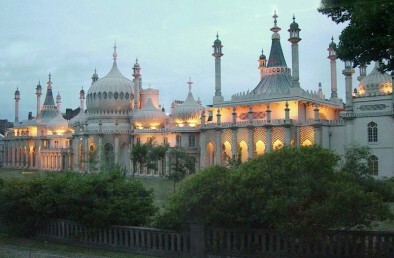 Come and see us at the Royal Pavilion wedding fair (Spring 09); this popular event with hand picked exhibitors will give you lots of ideas and inspiration.